If the dressing is seasoned nicely then you shouldn't need extra salt once you have dressed the salad. I like to serve on a flat style plate as it helps with presentation. Season the chicken breast with sea salt then grill until cooked through, should take 10-12 minutes. Rest on the side. For the vinaigrette combine the EVOO and vinegar in a bottle and shake well, season with sea salt. 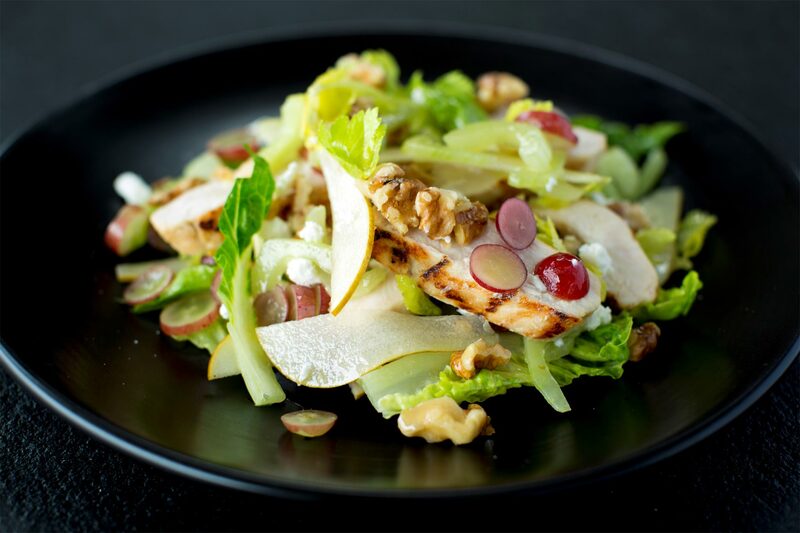 In a large bowl combine lettuce leaves, celery, walnuts, pear, and red grapes. Mix lightly and the dress with classic vinaigrette then lay out nicely on a plate. Slice the chicken and arrange around then sprinkle with goats cheese.